While Not Your Typical Appetizer, These Cheesy Bites Will Blow You Away! We love entertaining and having friends over, but don’t enjoy stressing over complicated recipes that take too much time to prepare and distract us from our friends. We want something quick and easy and that everyone will enjoy. 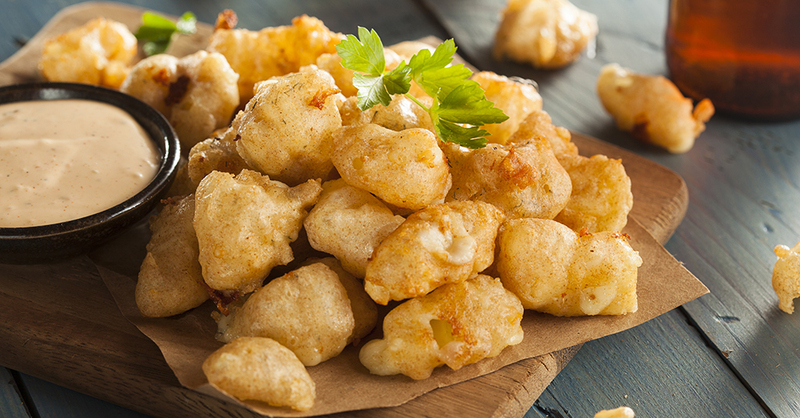 One appetizer that’s always a hit is beer-battered cheese curds. This popular recipe comes from Wisconsin, where it is often served at state fairs, and consists of a combination of cheese, beer and fried foods…what’s not to love?! They get devoured in no time, making them the perfect party food. We serve these with a spicy mayo dip, but you can use any of your favorite sauces for dipping – watch them go fast! Remove cheese curds from refrigerator and bring to room temperature. In a large bowl, mix together the pancake mix, eggs, beer, salt and pepper until combined, then set aside. Heat 3 inches of oil in a large pot or Dutch oven over medium-high heat until it reaches 425º F.
Working in batches, dip cheese curds in batter, then shake off excess and place curds in oil. Fry for 1 minute, or until golden brown, then remove with a slotted spoon and drain on a paper towel-lined plate. In a small bowl, whisk together mayo, hot sauce and garlic powder. Taste and add more hot sauce if desired. Place cheese curds on a serving dish and garnish with parsley. Serve with dipping sauce and enjoy!